Pope Francis, following in the historic footsteps of his predecessors, will cross the river Tiber to Rome's Synagogue, the Grand Temple, on the opposite bank of the river Tiber to the Vatican on Sunday. The building dates back to 1870, when Italy became a united country for the first time since the fall of the Roman Empire and the former Papal States ceased to exist. He will be welcomed by Italy's Chief Rabbi Riccardo Di Segni and by the head of Italy's Jewish community Ruth Dureghello. His courtesy visit, the third by a reigning pope, has aroused expectations of further rapprochement between Catholics and Jews. A Vatican statement last December said Catholics should not actively seek to convert Jews and must do all they can to repel anti-Semitic tendencies. This document, although it was not signed personally by the Pope, pleased many Jewish leaders. 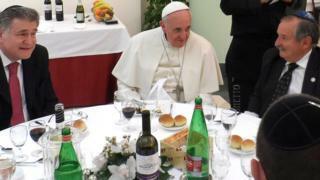 They took it as evidence that Pope Francis, who enjoys a close friendship with an Argentine rabbi (they even wrote a book together) intends to dispel any doubts that the Catholic Church has decided to turn over a new page in its troubled past relations, both religious and political, with Jews and with the state of Israel. The document pointed out that the first Christians were in fact Jews - which makes them different from people of all the other world religions. The Jewish community in Rome dates back to the second century BC. The trouble began in 1215. A Pope decided that Roman Jews should be recognisable by their dress. He decreed a special hat for the men with a cone in the middle and a scarf with blue stripes for the women. For 300 years after the Counter-Reformation in the mid-16th Century, the Popes, Rome's rulers, cracked down even further. They confined the city's Jewish population to an area which became known as the "ghetto" - an Italian word, originating in Venice, the site of the world's first Jewish ghetto, now used to describe any such forced residence of a particular ethnic, national or religious group. In the garden of the Grand Temple, situated in the heart of the former Rome ghetto, Pope Francis will commemorate both the deportation in 1943 of over 1,000 Roman Jews by Hitler's SS, most of whom perished in Nazi death camps, and an attack by Palestinian terrorists in 1982, Italy's worst post-war anti-Semitic act. Religious reconciliation with the Jews began with the issuing of the Second Vatican Council's most radical document "Nostrae Aetate" (In Our Times) in 1966. This key decision by the world's Catholic bishops and endorsed by Pope Paul VI unconditionally repudiated anti-Semitism and cancelled centuries of Catholics blaming the Jews for Jesus Christ's death. Celebrating the 50th anniversary, Pope Francis said: "From indifference and opposition, we've turned to co-operation and goodwill. From enemies and strangers, we've become friends and brothers."